The control panel is a new feature introduced with Version 6 and will inform you about all your configured backup tasks and the associated time schedules for automatic backups in a clearly-arranged form. In addition, you can edit time schedules, configure backups using Windows Task Scheduler as well as call additional tools for restore and verification of backed-up data and to clean up backup directories. You can select the desired function by clicking the buttons on the tool panel on the left of the window. On the right, the associated details will be displayed. All user-configured backups are displayed as a list. security copies will be created and an e-mail wiil be sent after backup. Description of task (optional): Double-clicking the text field will open a dialog to edit the description ⇒ more information. Moving the mouse over the destination directory field, will show a list of all directories to be backed up running the selected task. Clicking the backup log hint, will open a dialog to change the settings. Using the buttons below to the left, you can change the order of the entries and delete selected or all entries from the list. In so doing, only the list entries but not the task files will be deleted. At any time, you can add a saved task file to the list again by clicking the Open button. To edit the selected backup task, click the button at the top right. A dialog will open where you can, for example, add other directories for backup or modify the file selection or any other setting. On the right of the list showing the time schedules associated with the selected task you will find two buttons to configure these. Clicking the upper button will show the details of the selected schedule (here: 2: On logoff ...) for editing, whereas clicking the lower button will add a new additional schedule associated with the selected task ⇒ more information. 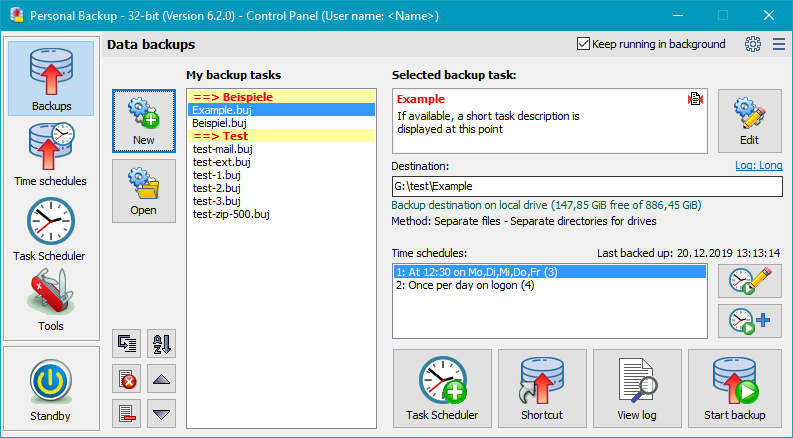 Task scheduler: The selected backup task will be added to Windows Task Scheduler to be performed automatically according to the specified time schedule ⇒ more information. Shortcut: A shortcut on the computer desktop for the currently-selected backup tasks will be created ⇒ more information. View log: A viewer window will open to show the log file belonging to the currently-selected backup task. You can inspect the log and print it if required. One selected task: The selected backup will be started instantly. The Control Panel remains locked until the backup has finished. During backup the user can select an action (e.g. shutdown) to be performed after backup (see here). Several selected tasks: All selected backups tasks will be started in background. The Control Panel remains operable so that more backups can be initiated simultaneously, but it is not possible to select a subsequent action (e.g. shutdown). This item brings together the functions for restore, verification and cleanup of files which can optionally also be saved as task files. When selecting a particular function, a list of the associated tasks that were created and saved by the user is shown. In addition, similar to the backup tasks (see above), the details of the selected task are displayed on the right. 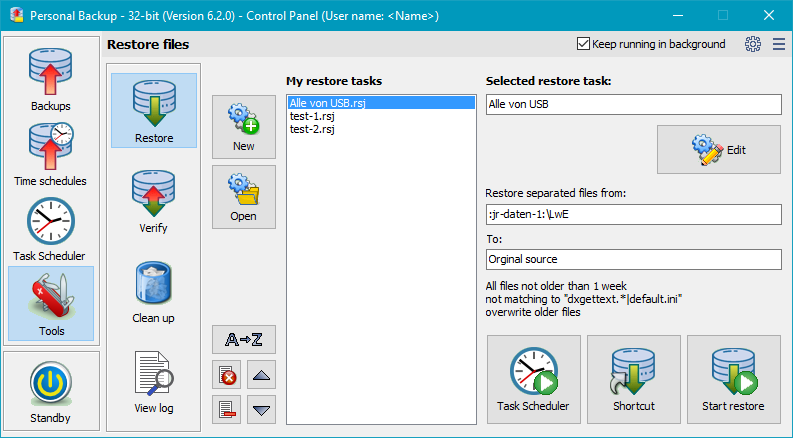 A summary of all user-configured restore tasks is displayed. To edit the selected restore task, click the button at the top right. A dialog will open where you can change the settings for this task. Task scheduler: The selected restore task will be added to Windows Task Scheduler to be started automatically according to the specified time schedule ⇒ more information. Shortcut: A shortcut will be created on the computer desktop for the currently-selected restore tasks ⇒ more information. Start restore: The selected restore will be started instantly. A summary of all user-configured verify tasks is displayed. To edit the selected verify task, click the button at the top right. A dialog will open where you can change the settings for this task. Task scheduler: The selected verify task will be added to Windows Task Scheduler to be started automatically according to the specified time schedule ⇒ more information. Shortcut: A shortcut will be created on the computer desktop for the currently-selected verify tasks ⇒ more information. Start verify: The selected verification will be started instantly. 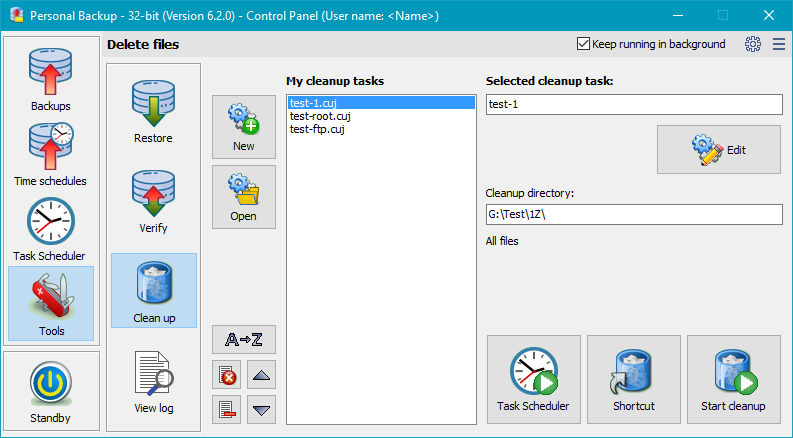 A summary of all user-configured cleanup tasks is displayed. To edit the selected cleanup task, click the button at the top right. A dialog will open where you can change the settings for this task. Task scheduler: The selected cleanup task will be added to Windows Task Scheduler to be started automatically according to the specified time schedule ⇒ more information. Shortcut: A shortcut will be created on the computer desktop for the currently-selected cleanup tasks ⇒ more information. Start cleanup: The selected cleanup will be started instantly. A viewer window will open to show the default log file. Clicking the appropriate button will print out or delete the log file. Additionally, you can search for the beginning of a backup section (blue arrows), backup errors (red arrows) or any other text. To copy the whole text to the clipboard, no text selection is required. For part of the text, select a section and type Ctrl+C or Ctrl+Ins on your keyboard. When you exit the program, all preferences including your selections for automatic backup will be saved. If at least one of the options for Automatic backups on logoff or at time of day is selected and/or Show icon in notification area is checked, the program will remain running in the background and an icon will appear in the Windows notification area (see below). If at least one of the automatic 16 tasks is activated as time controlled or at logoff, this box will be checked by the program and the Personal Backup will not be terminated when closing the main window, but will continue running in the background. The icon will then be displayed in the Windows notification area (usually at the bottom right-hand corner of the screen). Under Windows 7 and newer this icon may initially be hidden, in which case click the arrow adjacent to the notification area to view all hidden icons. To show the icon permanently (recommended), click on the icon and drag it from the hidden list to the notification area. Furthermore, the program adds a shortcut to the startup folder of the Windows start menu to be started automatically on next user logon if at least one automatic task (time-triggered or on logon/logoff) is active. If the user is logged on as administrator and at least one automatic task is using a Volume Shadowe Copy, in addition the Run as administrator flag of this link will be set. Left-clicking the icon in the notification area will show a list of all pending automatic backups, right-clicking it will call a context menu from which one of several actions can be initiated (e.g. backup, logoff). Checked: The program remains running in the background after closing the main window even if no time schedule is configured. A backup can be started manually using the right-click context menu of the icon. Unchecked: All automatic tasks will be temporarily disabled. If the main window is closed, the program will be terminated. You must restart the program manually to reactivate the configured automatic tasks. Configure backup schedules - Launch the supplementary program PbPlaner, to configure alternating backup schedules using Windows Task Scheduler. Restore files - Launch the supplementary program PbRestore to select single files from backup (even when compressed and encrypted) for restore to any location. Restore from zip archive - Launch the supplementary program PbRestore to restore files from a zip archive in which also archives with encrypted filenames are supported. Start Backup under different account - Launch the supplementary program PbStarter to configure backups so that they will be started under a different user account. This is good way to protect the backups from manipulation by malware. Thunderbird mail backup - Launch the supplementary program TbBackup to help less-experienced Thunderbird users to backup and restore their mail data. Delete old log files ... - Delete all log files from the current log directory older than an adjustable fixed date or older than a selectable number of days, weeks, months or years relative to the current date. Check for update ... - A connection to the Internet will be established to check if a new update is available (details).